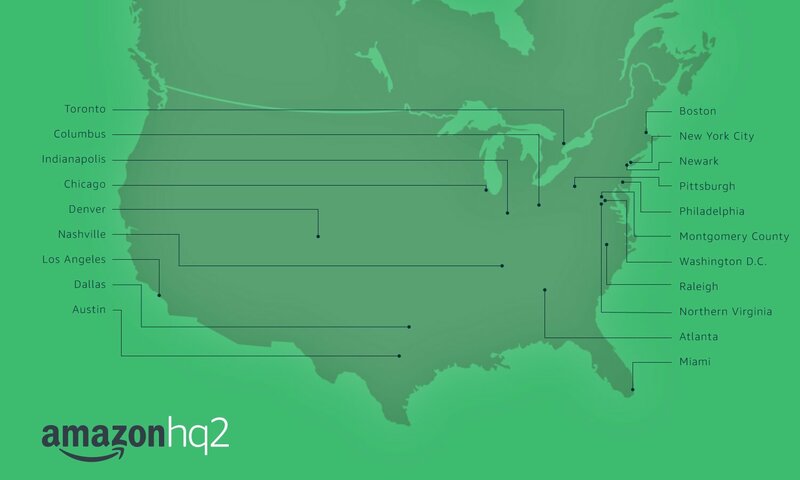 Amazon has reviewed the proposals from potential candidate cities for its second North American headquarters location, and it found 20 of those the most promising. The mayors of these top 20 cities will now fight to the death in a Battle Royale-style island arena… er wait, no actually they’ll just move on the next portion of Amazon’s submission phase, which includes further proposal evaluation and working directly with the candidate cities on getting more info. Amazon says it expects to make a final decision about which gets the nod sometime in 2018, so by the end of this year. It also clarified in its release that this will definitely be a true second HQ, rather than simply a sizeable satellite office, and will include $5 billion in investment from Amazon, with the potential to support as many as 50,000 “high-paying” jobs. Toronto is the lone city to make the top 20 outside of the U.S., despite original applicants from the U.S., Canada and Mexico. Also, note that these are listed in alphabetical order: Don’t get any ideas, Atlanta. Here’s the map of those locations if you wanted a more spatial view. Some people have noted that the Washington/Raleigh/Montgomery County cluster might indicate Amazon has a strong interest in ending up somewhere with close proximity to the seat of U.S. government – but that doesn’t mean D.C. is necessarily a shoe-in: Some of the other cities will probably do much better in the evening wear portion of the competition.